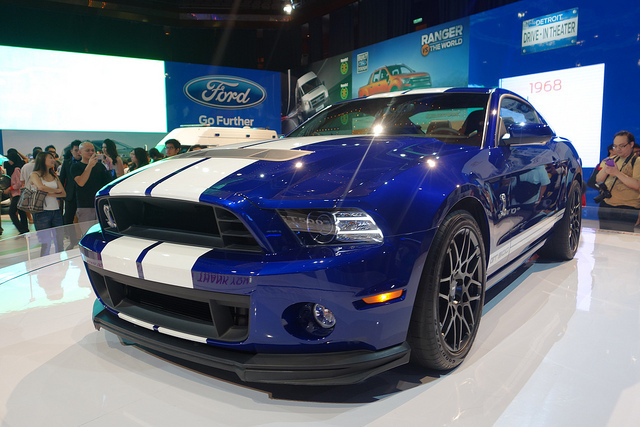 The 2013-14 Shelby GT500 is one of the fastest Ford Mustangs of all time. Featuring a 5.8 liter V-8 engine rated at more than 660 horsepower, the car can go from zero to 60 MPH in just 3.5 seconds. Riding on a 32-valve supercharged engine, the car produces 631 lb-ft of torque at 4,000 RPM, and the car completes the quarter-mile in 11.6 seconds reaching a max speed of 125.7 MPH. For consumers looking to purchase the car new, the starting price of the Shelby GT500 is $54,995 USD, and the top speed of the car is 202 MPH with a stopping range of 155 feet at 70 MPH. The overall fuel economy of the vehicle is 15 MPG (city) and 24 MPG (highway).